Spending more than a week here, we thought we’d be able to tick all the sights off our list. Spending more than a week here, we thought we’d be able to tick all the sights off our list. Even with a packed schedule, we honestly only scratched the surface. It is easily one of the most breath-taking cities in the world. A place that offers everything from mountain viewpoints and beach hangouts to enlightening museums and a jumping downtown nightlife. Not to mention world-class winelands on its doorstep. Mitch Lockhart, head of social media and digital marketing for Devil’s Peak, gives us the insider’s tour to the Cape Town beer scene. Visiting four totally different breweries in a day, we get a fantastic perspective on how much variety there is, both in terms of the beers and the stories of the people brewing them. And, as with craft beer communities elsewhere, there’s a strong thread of collaboration between brewers. Devil’s Peak comes up in conversation every stop along the way as having supported, partnered with or brewed interesting new beers with each of the people we meet. The Taproom at Epping is a warm, welcoming pub and restaurant with views of the Afrofunk sour facility, the largest barrel ageing program in the country, and a full complement of the latest and most innovative beers from DPBC and friends. Based in the trendy Woodstock neighbourhood, we meet the brewery’s founder Lethu Tshabangu. Right next to the fantastic Saturday Neighbourgoods Market, it’s a great stop to make after building up a thirst checking out the hundred or more food stalls, live music and arts and crafts sellers. Originally from southern Zimbabwe, Lethu is a member of the Ndebebe tribe and his own teenage experiences of rural African beer culture have influenced his modern craft brewery. His bestselling Sorghum Saison is a must try, being a reinterpretation of the traditional Umqombothi drink. The ‘q’ is pronounced by clicking your tongue - something I’ve been trying and failing to master ever since. Traditionally made by pounding sorghum in water and leaving it to ferment with water overnight, before adding more malt and water, the mash resembles porridge and is later hand-filtered by squeezing through a special reed cloth called an Ishluzo. “My granny would make it and teach the girls in the family to make it, too,” Lethu explains. His wife, who works with him in the brewery, learned to make alcohol this way. Having tasted the original with the Devil’s Peak team during a night out at Beerhouse (packaged in a carton, it looks like fermented milk and doesn’t taste much better), I can say that Lethu’s saison is a wonderful reinterpretation; a tasty, slightly spicy saison, with the sorghum providing extra mouthfeel. We loved the concept of reinventing traditional African techniques. “I’m working on a NEIPA made with millet,” he says, as he casually fills a beautiful ceramic pot with a litre or so of saison. 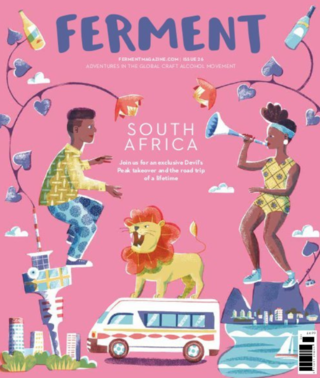 “In our culture, if a guest visits the village, everyone will take a sip from this pot – it is called an Ukhamba, like my brewery,” Lethu says, as he and his two brewers take the first sips. “Then the guest has to finish the rest of the pot”. As it’s 11am and we have a full schedule ahead, I sadly have to disappoint their tradition, but do enjoy a few good gulps before getting on our way. Mitch introduces us to founder Nick Smith, originally from the ‘Soul City’ of New Orleans: “I met a beautiful South African girl, you know the story.” Having worked in craft beer in the US for years, it quickly becomes apparent that he’s a real pro. Using his experience to produce hop-forward but also exciting mixed-fermentation beers, the tiny Soul Barrel has gained a strong following among local craft beer geeks. Based in an old brick-walled wine storage facility, the location greatly inspires the beers that he creates here. In winemaking, they have a saying that “It takes a lot of beer to make wine,” so this little idiom became the nexus of the first beer we taste. “Pale Farm is the beer we’d imagine winemakers would drink in the South African heat all day long,” he explains. Cape Cone, his 100% South African hop IPA is made with an ever-changing variety of local hops. “The growers here have developed varieties that are really unique and not available anywhere else,” he says. Complex and beautifully balanced between aroma and bitterness, the incarnation that we taste shows off the best of Southern Passion, African Queen, Southern Star and N1/69 hops. The pièce de résistance of his line-up is his ‘Cape Wild Ale’, which has its primary fermentation in a 500L wine barrel. Every batch is different, as is the nature of mixed culture fermentation, and the glass he pours for us is so delicately sour, complex and floral that we ask him for a second. He ages the finished beer for three weeks with local fynbos botanicals (taken from a very specific type of regional shrubland). “If it’s harvest time, I’ll also chuck in a few kilos of freshly harvested grapes from the local winery,” he says. About an hour’s drive out of Cape Town, we find ourselves in the beautiful Franschhoek wine region. “Franschhoek is so adorable it’s almost nauseating”, Mitch says. “There’s a Main Street and everything, it was originally a French Huguenot settlement in the 1600s and has since become the culinary capital of South Africa”. Showing us around is CBC’s humorous and affable German founder, Wolfgang Koedel. “I grew up in the beer triangle between Bamberg and Würzburg in Bavaria. These small villages were run by the priest, the mayor and the brewmaster,” he laughs. On learning that people working at those breweries got to take home 14 cases a month, he promptly enrolled to study chemistry. His lifelong career in beer saw him work at a malt factory: “Some craft brewers just talk about hops, but there’s a whole science to malts. Trust me, I’ve definitely messed up a few hundred tonnes of malt in my career.” Later applying his expertise to opening Paulaner brewpubs in Asia and elsewhere, ultimately the South Africa bug bit and he and his Chinese wife settled here. After Paulaner decided to close the brewpub he was running in Cape Town, it sold the kit to Devil’s Peak and he set up CBC. Producing mostly German styles using exclusively noble hops it also has a series of more experimental beers from its brewers. The setting on a beautiful old winery alongside a pizzeria and gourmet burger restaurant makes for a great afternoon. Showing us around this brewery in the heart of wine country is head brewer Olaf Morgenroth. Born in South Africa to German parents, he studied at nearby Stellenbosch university. “With so many great wineries and restaurants in the region, it seemed obvious when we started that a great brewery had to be the next step,” he says. The interior has the high-class feel of a winery tasting room, a familiar-feeling stop on the wine route for travellers whose palates perhaps need a break from fermented grapes. Founded by Scotsman Alex McCormack, who shares a glass of his award-winning stout with us straight from the fermenter, along with American businessman Frank Rodriguez and top South African chef Reuben Riffel. With a full kitchen, the brewery offers a gourmet tasting menu. While we enjoy a glass of its outstanding 8.4% dry-hopped saison, Louise and Paul from Manchester overhear that we are writing an article. “We’ve been eating and drinking all over South Africa this holiday and felt compelled to tell you this was hands down the best meal we’ve had,” says Louise. Heading back into central Cape Town, we’re in luck. “It’s First Thursday, or ‘Thirst Thursday as we like to call it,” says Mitch. The biggest night of the month, it feels like everyone has come out to party. We meet up with Russell, Richard van Wyk and other members of the Devil’s Peak team, along with their friend Sifiso, who is involved in the creative scene up in Joburg. Showing us around the buzzing Long Street, Bree Street and the outdoor night market at St George’s Mall, there’s food stalls, a techno DJ and Devil’s Peak have a bar. 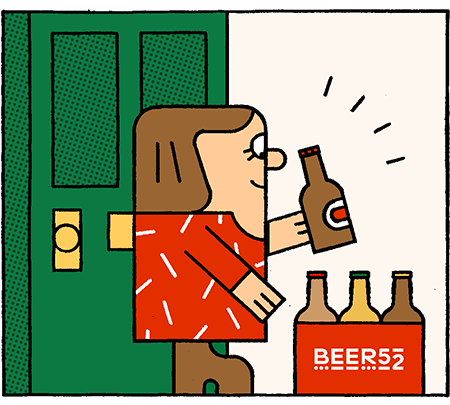 We grab a can of its Mikkeller collaboration ‘Capenhagen’ and head around the corner to a Latin music night at trendy hangout The House of Machines. Finishing things off with a few King’s Blockhouse IPAs, it’s too soon time to stumble home to bed.